What determines economic growth? - FreeEconHelp.com, Learning Economics... Solved! 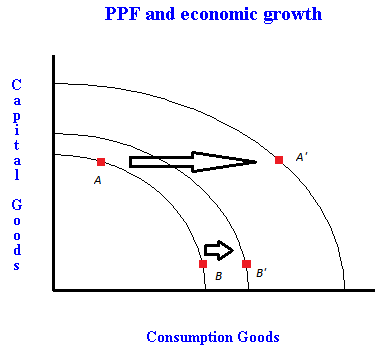 Home growth macroeconomics PPF What determines economic growth? What are the determinants of the long run growth rate? Generally three components are considered when determining the long run growth rate (looking at the growth of per capita GDP). Labor productivity measures the amount of goods or services that can be produced by a worker. Most of the time labor productivity is also measured in hours, such as good produced per hour of work by a worker. Being more productive means that the same person can produce more things on average, which also means that she and the rest of the world can also consume more things. Economists generally agree that three things drive productivity: human capital, technology, and physical capital. Human capital is a measure of the amount of knowledge or skill a person has. By training, or going to school, someone can increase their human capital. Smarter, more skilled people can produce more stuff on average then people without training. Technology plays an important role, and improvements in technology are generally called technological change. Typically technological change is based on improvements in machines, equipment, and software. But technological change can also occur in how factories and stores are organized. The development of the assembly line and specialization is an example of technological change. So are the internet, computers, and faster computer chips. Physical capital also plays an important role in GDP growth rates. The idea of having more computers, robots, or roads in an economy will increase the amount of goods or services that can be produced. But having capital doesn’t mean we will grow, we need to make more capital in order to see a change in growth rates. By increasing the amount of capital produced in our economy each year, we will see growth rates increase. The biggest difference between China and the U.S. right now is that China is investing most of its profits into new factories and technologies, while the U.S. is spending its profits on consumer goods. 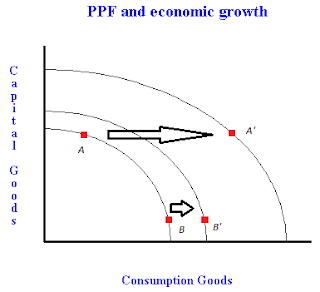 Let’s look back at the idea of a PPF, and how a PPF can change based on the types of goods that are produced. If only two types of goods can be produced (consumer goods, and investment capital) then we have a tough choice to make. The more consumer goods we produce, the happier/healthier/richer the people will be in the short run (because point B results in more consumer goods than point A). However, the more capital goods we produce now, the more of both types of goods we can produce in the future (as you can see, at point A' we can produce more of both types of goods than is possible at point B'). So we face a tradeoff between happiness now, or happiness in the future.